Hey everyone! It’s thefakesamjoseph here bringing you great news! The winners of the 21st annual Screen Actors Guild Awards were announced recently! Winners include Viola Davis for Best Performance by a Female Actor in a Drama Series in her role as Annalise Keating in “How to Get Away With Murder” and Uzo Aduba, for Best Performance by a Female Actor in a Comedy Series in her role as Suzanne “Crazy Eyes” Warren in “Orange Is the New Black”. 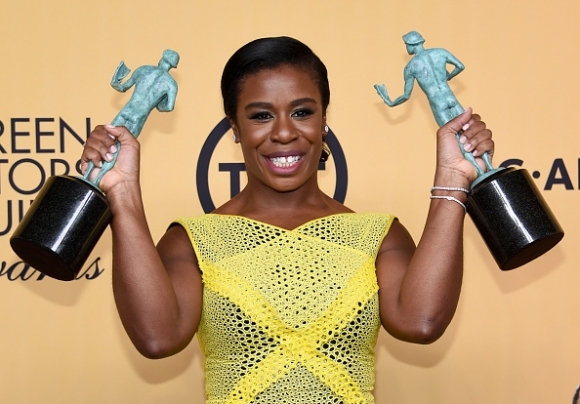 Aduba also won a second SAG award, along with her fellow cast for Best Performance by an Ensemble in a Comedy Series. Congratulations to these two ladies for their very well deserved wins. Take a look below for the full list of winners! This entry was posted in Blog Posts and tagged acting, Actors, actress, black actress, Black Women, Celebrities by thefakesamjoseph. Bookmark the permalink.